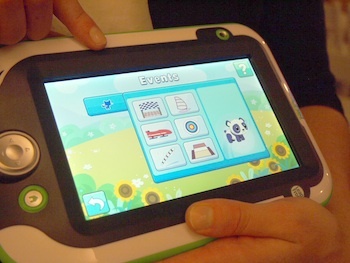 LeapFrog is known for their educational and entertaining gamepads for kids. Now they are determined to make physical activity fun with the LeapBand – the first watch-style activity tracker for children. As LeapFrog's Senior Manager of Public Relations Monica Ma said to Techlicious at the launch event in New York City this week, the company studied the wearable devices currently on the market, and came to the conclusion that it couldn't just shorten the straps of current trackers and re-package them to kids. After all, children are still too young to understand all the data that typical activity trackers and their apps collect. What do they know about their resting heart rates or the number of calories they need to burn to lose weight? Since kids learn best when they're having fun, the company decided to look to popular games like the Tamagotchi virtual pet for inspiration. At the core of the LeapBand is an accelerometer that measures how much your child is moving all day long. But for all he knows, he's simply copying the moves of its virtual pet to earn in-game rewards. He gets to choose one of eight pets (a Pet Pal cat, dog, dragon, monkey, panda, penguin, robot or unicorn) the first time he turns on the LeapBand, and will get to unlock new ones the more jewels he earns by playing with his pet. In challenge mode, the child gets the most exercise by emulating the on-screen actions of the pet, such as "popping like popcorn" or "rolling like a log". He can access these challenges by pressing the button on the left side of the device. 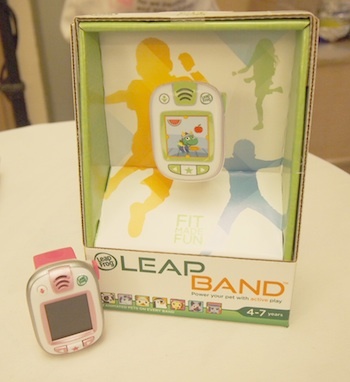 Since the LeapBand is designed to encourage kids to become more active, there is no wrong way of moving as the accelerometer will basically register any movement. This lack of precision makes the device more forgiving for the still-developing child’s movements. At the same time, a lazy kid could game the system by shaking the device all day to rack up the rewards, but he doesn't need to know that. The device comes with 10 challenges, but parents can download an additional 40 for free and specify the ones each child has access to. 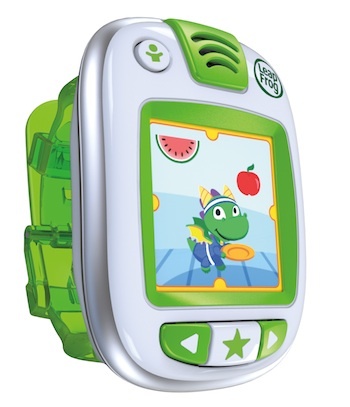 If parents and teachers are worried that kids will become too hooked on playing with their LeapBands to pay attention in class, they'll be glad to know they can restrict active playing time down to the specific days of the week and hours in the day through the Leapfrog Connect software. During school hours or bedtime, for example, the LeapBand will look like an analogue watch and only tell time. As a result, the child won't be able to access their pet but they can continue to earn points for their physical activity. Don't worry if your child is skilled at undoing parental locks: these settings can only be controlled by the parents' LeapFrog software, which reside on a separate computer. When your child is too tired to challenge his pet, he can also play mini-games such as Pet Boogie (works like Dance Dance Revolution) with the directional buttons below the screen, or take his pet to the Pet Parlor for some pampering. 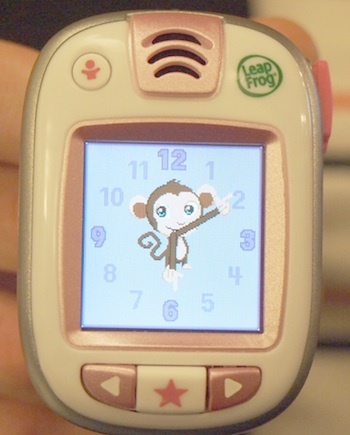 Since the LeapBand is not a true virtual pet game, the child is not required to play these mini-games at all. At most, the pet may become sad if its master won't play with it, but it won't die due to neglect. When your child really can't be pouncing around like a tiger -- especially when you're flying in an airplane -- he can still earn valuable rewards for his pet on a tablet. You just need to install the Petathlon app on his LeapPad Ultra, iPad or Android device (the app is compatible with iOS 6.0 or higher, and Android 4.03 or higher), sync the data from his LeapBand to the Leapfrog cloud, and all his rewards and characters will be accessible from the tablet. Through the app, he can play games that aren't available on the LeapBand, and earn special rewards like different colored tracksuits for his pets. Although the LeapBands at the press event were just prototypes and not the final design, they really look like wearable Tamagotchis with rubber wrist straps that you wear like a watch. According to the Leapfrog team, the strap could end up being translucent with a hint of hot pink, blue or neon green, and will feature a typical watch closure. The tracker itself has a full color non-touch display that is bright enough to clearly see your pet, four physical buttons you use to interact with your pet, a front-facing speaker so you can hear instructions and other educational facts, as well as a USB port with a rubber cover. There is an internal battery that recharges by connecting to a PC via USB. Under normal usage each charge is estimated to last between three to five days. This is also the same port you use to connect the device to a computer to sync the data (pets, rewards and fitness data) to Leapfrog Connect. As a product that is designed from the ground up for children between the ages four and seven, the Leapfrog team assured us the device is water resistant and can withstand some abuse by kids. It's a little on the thick side for our taste but it feels quite light in-hand, so it should will feel no different than wearing a plastic watch on the wrist all day. Our biggest gripe with its design is that it lacks a physical volume button to control the audio, which makes the audio tips and prompts hard to hear, especially in a crowded room. We're hoping the final design will address this shortcoming. When can I buy the LeapBand in stores? Leapfrog is aiming to get these adorably addictive LeapBands into stores by early August, which is just in time for a new school year. Priced at an affordable $39.99, they're sure to be big hits on playgrounds and with health-conscious parents this holiday season. Now if they put in a gps tracker that’d be great. I think it is neat seeing where I was on my run, so seeing where my kid is running around would get cool.